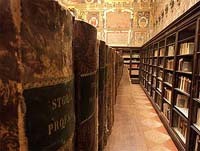 The rich decorations of the Archiginnasio constitute the biggest existing heraldic wall complex, and have provoked the admiration of visitors and scholars in all ages. 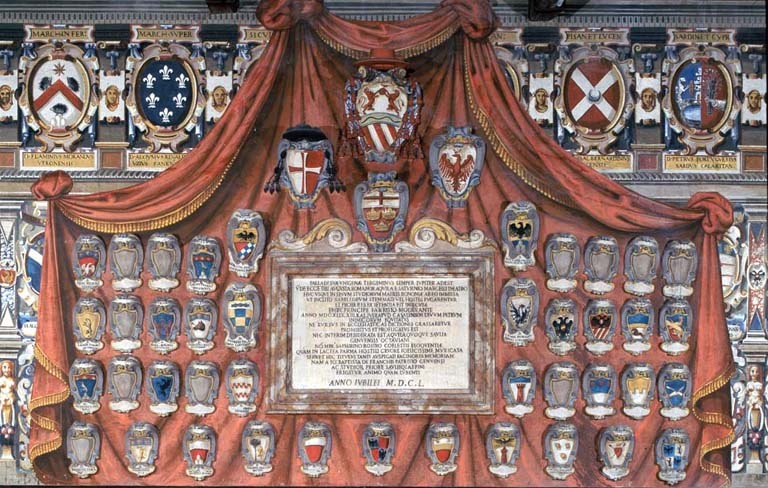 The coats of arms were put there to reinforce the idea of authority and power of the institution: as in the gallery of noble palaces the paintings celebrate the splendor of the family, as so in the University the heraldic decorations emphasized the history, the prestige of the academic tradition, while the inscriptions and the mottos were an invitation to the intellectual and moral elevation. From the construction of the building until the end of the 1700s inscriptions and commemorative monuments of the masters of the Studio were placed there, together with the students' coats of arms. Currently, the coats of arms that follow one another in the halls, in the corridors and along the grand staircases are around 6,000. Organized in horizontal stripes or surrounding the celebratory monuments, the coats of arms account for more than just the name and the place of origin of the student, but also of the home country that the student was representing. The upper loggia: the painted "memories"